Visual Studio Code>Other>AWS CLI ConfigureNew to Visual Studio Code? Get it now. 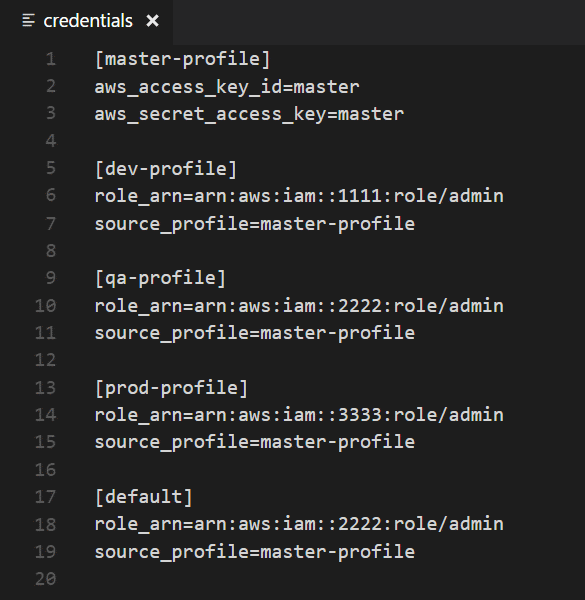 Quickly access the AWS CLI config & credentials files and set any named profile as the [default] profile. The AWS CLI Configure extension allows you to quickly access AWS CLI information and docs from Visual Studio Code. Now the name is on the clipboard. Paste away! Saving the 'credentials' file from VSCode or setting the default profile updates the status bar. Click the item in the status bar to set the [default] profile to a [named] profile. This sample shows the master-profile in one account that uses an access key and secret and three role profiles each in a seperate account that references the master-profile as the source profile. The [default] profile is set to qa-profile. Feedback and contributions welcome. Please leave a review.